Hanover, October 2009. 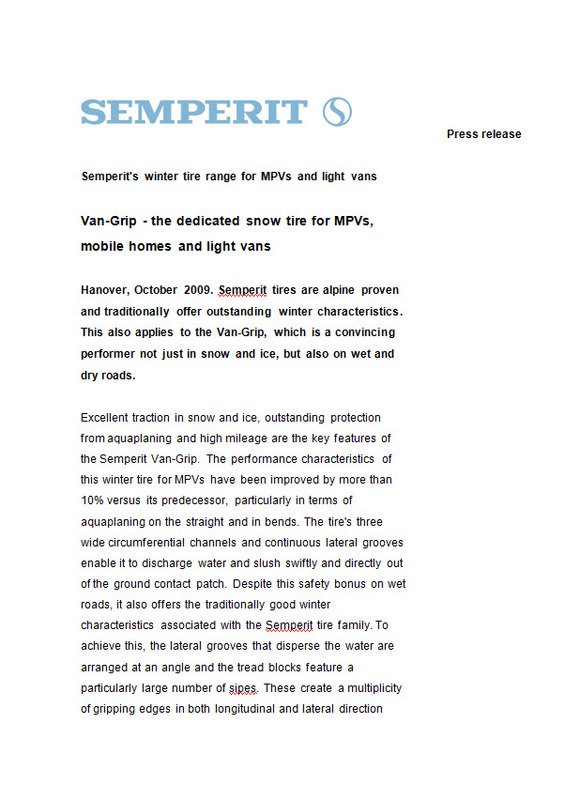 Van-Grip - the dedicated snow tire for MPVs, mobile homes and light vans. Excellent traction in snow and ice, outstanding protection from aquaplaning and high mileage are the key features of the Semperit Van-Grip. The performance characteristics of this winter tyre for MPVs have been improved by more than 10% versus its predecessor, particularly in terms of aquaplaning on the straight and in bends. 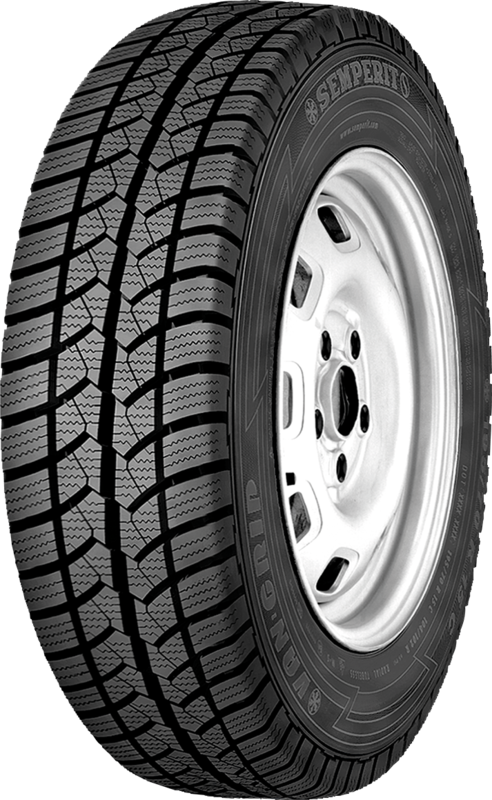 The tyre's three wide circumferential channels and continuous lateral grooves enable it to discharge water and slush swiftly and directly out of the ground contact patch. Despite this safety bonus on wet roads, it also offers the traditionally good winter characteristics associated with the Semperit tyre family. To achieve this, the lateral grooves that disperse the water are arranged at an angle and the tread blocks feature a particularly large number of sipes. These create a multiplicity of gripping edges in both longitudinal and lateral direction that interlock with snow and ice on roads in winter. Like its summer counterpart, the Van-Life, the Van-Grip also boasts the Flat Belt Concept, consisting of an exceptionally flat belt and a wide tread. The flat contour is a crucial factor in ensuring that the tyre rolls very evenly, thereby minimising tread wear by a remarkable 5% versus the previous model. This gives the Van-Grip a clear advantage in terms of mileage performance. The Van-Grip will be available for the coming winter in a total of 20 sizes for 14", 15" and 16" rims, and is approved for speeds of up to 190 km/h (118 mph). Semperit. A brand of Continental.